SliQ Invoicing supports MTD for VAT allowing you to use HMRC's online API to view your open and fulfilled VAT obligations and submit VAT returns. SliQ Invoicing's MTD for VAT feature has been approved by HMRC and calculates your VAT sales figures from your invoices while allowing you to enter your purchase VAT figures to complete your VAT return. 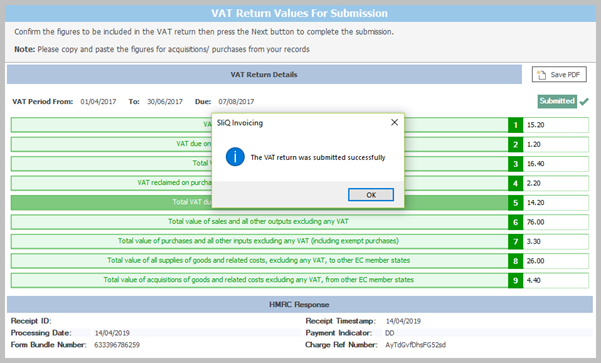 To submit a VAT return, SliQ provides an easy to use wizard that steps you through authorising SliQ to make submissions on your behalf, getting your VAT obligations from HMRC, choosing which invoices or payments to include on the VAT return then making the submission. The first MTD wizard page gives some setup instructions reminding you to make sure you have set the country codes for your customers to let SliQ know if your customers are in/ out of the European Community. On this page you can also choose between invoice and cash accounting, i.e. whether the VAT amounts in a VAT period are calculated from the invoices raised in the period (invoice accounting) or payments actually received (cash account). 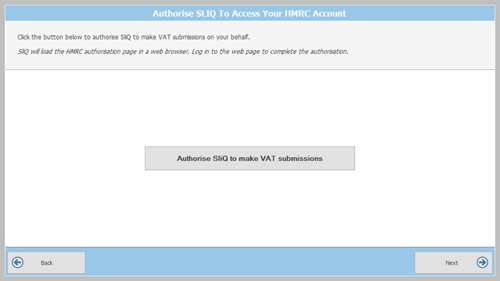 On the second MTD wizard page you authorise SliQ to be able to access your VAT data held by HMRC and to be able to make submissions. To complete the authorisation your will have to sign up your business for MTD for VAT on HMRC's website. Note: Once you have authorised SliQ, the wizard will no longer show pages 1 and 2 making the process of submitting a VAT return even simpler. On the third MTD wizard page SliQ gets your VAT obligations from HRMC. You can view the VAT returns for any fulfilled obligations or choose an open obligation and press the Next button to choose which invoices or payments to include in the return. 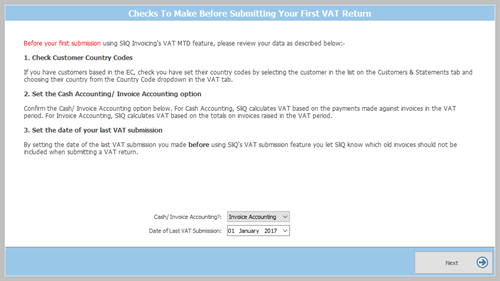 After choosing an obligation and pressing Next, SliQ shows the invoices raised in the period of the selected VAT obligation. After selecting your invoices and pressing Next SliQ shows your partially completed VAT return with the sales figures from your invoices. You can then type in your purchase VAT figures. After entering your purchase VAT figures, you can submit your VAT return. You can then save a PDF of the submitted return or view the return in the fulfilled obligations returned by HMRC. Clicking the button below will take you to our downloads page where you can download the latest version of SliQ Invoicing. SliQTools is a UK software development company specialising in the development of business software for small to medium sized companies. Looking for cloud-based invoicing software instead? Check out our online invoicing software.